I've made it no secret that, when Second Edition was released, I was one of it's loudest naysayers on the old Decipher boards. I certainly wasn't a fan of Backwards Compatability of its cards into my favorite game. And yet, the marketing scam worked well enough to get me to buy the product. Specifically, I bought and traded cards from the first two sets to get any and all BC Romulan cards. But while it was nice to have more options for my fleets, those cards never quite worked as well as their First Edition counterparts, as the stats were too low and the special abilities rarely made them enticing. The Serrola was certainly one of the cards that I chased, but it never did get used in a deck, as there were just far too many better cards to use. The Serrola was another beautiful D'deridex ship to add to the armada, and like the others it required three personnel to staff it. However, the stats of: 6 Range, 7 Weapons, and 7 Shields made it by far the weakest option available - unless you could activate the special gametext. 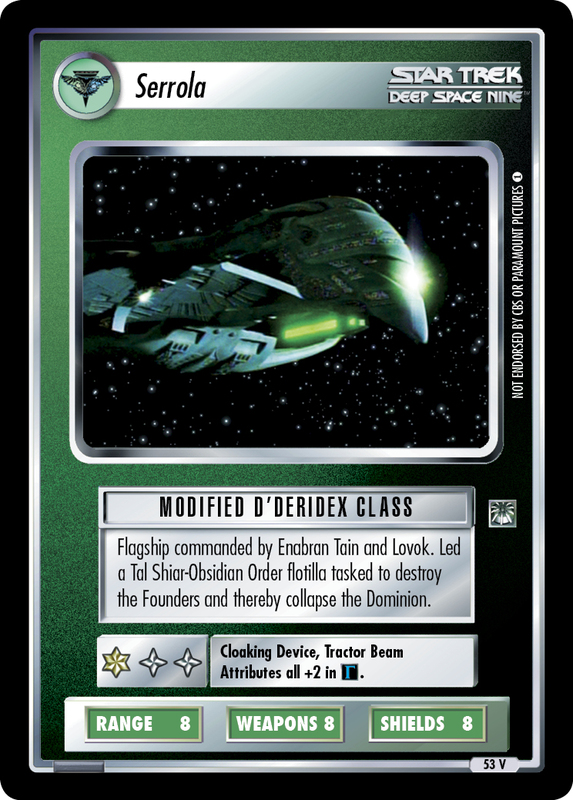 The common D'deridex has 8 Range, 9 Weapons, and 7 Shields meaning that this is one of the few times that '45 Dom Perignon would be a bad play. All of the PAQ era rare D'deridex ships have stats adding up to 25 (5 higher total) and can benfit from matching commanders. 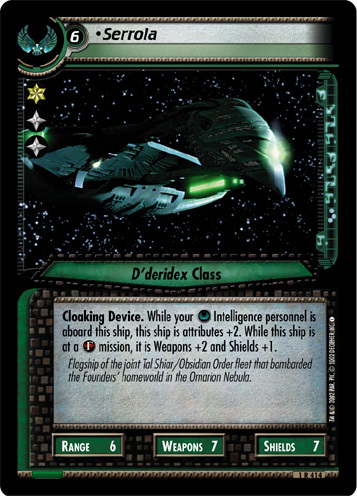 But perhaps the best Romulan ship has long been the D'deridex Advanced, which can be fetched with Spacedoor and, in a Tal Shiar heavy deck, is always sitting at a cool 9 Range, 10 Weapons, 9 Shields. But what perhaps sets this ship apart from the other D'deridexes is its special ability. Before conversion, having a Romulan Tal Shiar perosnnel on board would increase the Range, Weapons, and Shields by 2. When it was in the Gamma Quadrant, it would get an additional boost of 2 to the Weapons and 1 more for the Shields. But all of this is a lot to try to put into the special equipment box along with Tractor Beam and Cloaking Device, so the conversion simplifies this to just +2 for all the attributes while in the Gamma Quadrant. All of this simply means that it is still a weaker choice than the universal D'deridex Advanced for a Deep Space 9 property logo only or all inclusive Romulan deck that wanders around the Alpha Quadrant. But once it gets to the other side of the wormhole, it's instantly a 10 across the board, reagardless of what skills are on board. Clearly this ship was built for one purpose. But wait, there's more: it also finally has a matching commander, or rather, two of them. Both Enabran Tain and Lovok are listed as matching commanders with all the benefits that that entails. Captain's Log (free now with the purchase of a Ready Room Door) will boost those stats to 8 Range, 11 Weapons, and 11 Shields in the Alpha Quadrant, while a matching commander is aboard, and 10 Range, 13 Weapons, and 13 Shields in the Gamma Quadrant. Defiant Dedication Plaque (free now with the purchase of a second Ready Room Door) can boost the stats to 10 Range, 8 Weapons, and 8 Shields in the AQ or 12 Range, 10 Weapons, 10 Shields in the GQ. Grab both and its a 10 Range, 11 Weapons, 11 Shields in the AQ and 12 Range, 13 Weapons, 13 Shields in the GQ. If that isn't enough to impress you, remember that The First Stable Wormhole already makes your Gamma Quadrant missions -1 range across the board. It might be time to start self seeding Cytherians. While getting both the Defiant Dedication Plaque and the Captain's Log into play might take a few turns, finding a matching commander shouldn't. With two options that both play for free at the Continuing Committee, this ship should be ready to hot rod all around the Dominion neighborhood. Perhaps you could even seed a copy of Make It So for the always sweet full ship and crew unstop, or it could guarantee that you can grab a Ready Room Door on turn 1 to start pumping up that Serolla.